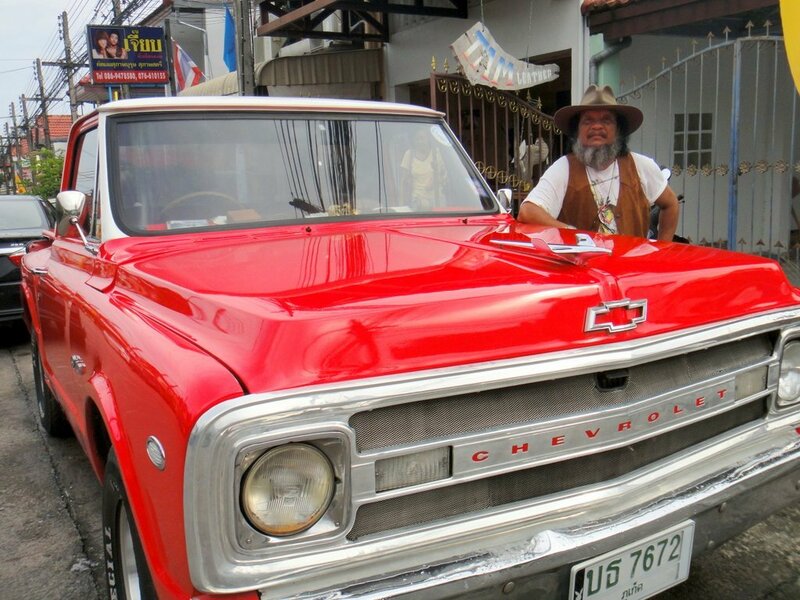 PHUKET: If you’ve ever been to the Naka Weekend Market in Phuket Town, it is likely that you will have met or seen self-styled bar-tending cowboy Sieksan ‘Tam’ Siechoo. Bar-tending cowboy Sieksan ‘Tam’ Siechoo. He is perhaps most recognised, at least among the shopping tourists and members of the island’s foreign community, as the owner of the rather unique bar set right in the middle of the market. Tam is an avid nature lover and decided to build his cowboy-themed bar with the concept of sustainability in mind. For instance, in place of bar chairs he has used large tree stumps to sit on. “It’s meant to look like a log cabin, with nothing artificial or man-made about it,” says Tam. For decoration he added cactus plants to represent the arid desert of the American west. In keeping with the cowboy theme he has an old Texas driver’s license pinned up to a wooden pole below the bar, and one of Tam’s old leather boots has been cleverly crafted into a pot plant. After wandering the endless lanes of market stalls seeking bargain souvenirs and trinkets, many a tired feet are rested and parched throats quenched at the bar. 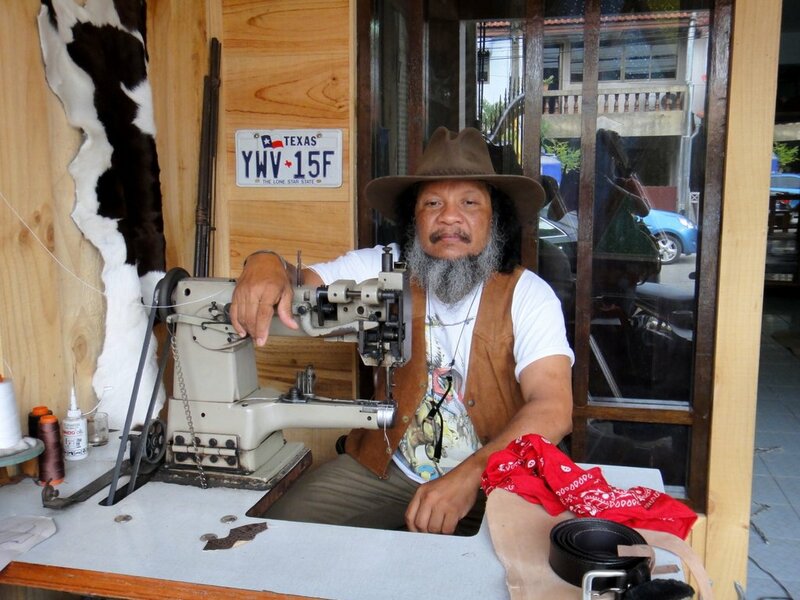 As well as Tam’s cowboy-themed watering hole, which is as distinctive as he is, his home also doubles as a shop front for his other business – making leather products. Tam’s leather shop is located inbetween a hair salon and flower shop off Chalermprakiat Road, easily identifiable by the bright red vintage Chevrolet C10 that is parked outside. His work space is scattered with odd bits of leather and the smell of glue and cow hide lingers in in the air. Tam was born in Tanort, Songkhla. The province is generally known for its rice and shrimp farming, which are two of the most important economic activities in rural southern Thailand. He chuckles when The Phuket News asks him why he didn’t end up, like all the other Thai men in his neighbourhood, working on the shrimp farms. He recalls that after school he would rush home to watch cowboy movies and then re-watch them until the tape on the VCR player would start to skip. At the age of 21, Tam was enlisted in the Thai Army in Chanthaburi province for two years and, as fortune would have it, at that time they were only accepting applicants for leather making positions. So he spent the next four years repairing the leather belts and shoes of the officials in the Yala and Pattani regions. After finishing his studies in the Army School, Tam decided to move to Phuket, his reasoning behind the move was to find a niche market to sell his handmade leather goods. As Tam could see that there was a growing expat community living in Phuket, he decided that his target market would be primarily non-Thai-big bike lovers who were looking for custom-made leather boots, belts, bags, wallets and, of course, saddlebags. Tam’s work is of a very high quality and he is quick to point out that throughout his 30 years in the leather industry he has made a conscious effort to sell his leather products for at least a third of the cost of Italian designer leather. He feels that everyone should be entitled to afford a good leather bag without it leaving a burning whole in their pocket. A genuine Tam small tote bag costs around B4,000 and leather jackets between B7,000 and B10,000. He favours using cow hide over crocodile, as despite being less aesthetically pleasing it is more durable and doesn’t tend to crack after long usage. When Tam isn’t manning his bar in the market, or creating custom-made pieces at his Phuket Town shop, he spends his free time teaching kids at the Mae Fah Luang School for Disadvantaged Children.